This mode works fine with my 1440p monitor, but did not show up by default and had to be selected manually. 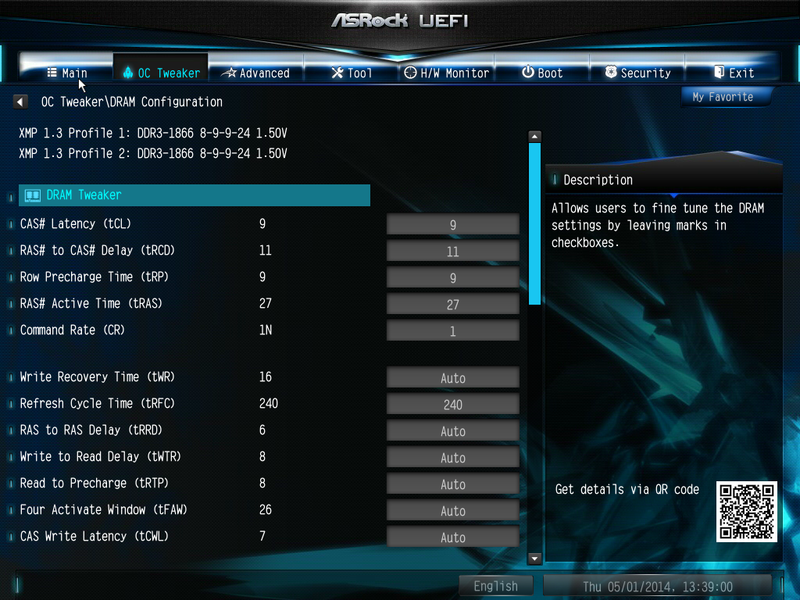 GIGABYTE originally had that issue with their Z87 1080p BIOS, but it is fixed for Z97. 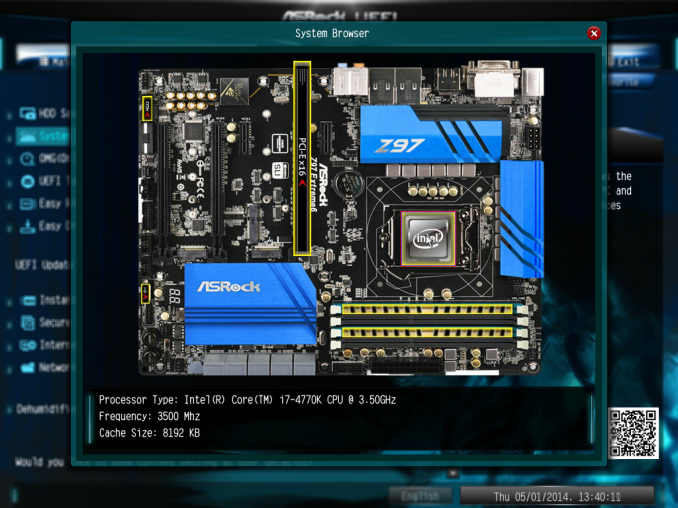 One of the common criticisms I have with ASRock BIOSes is the lack of information on the initial entry screen, especially when their competitors are ahead in this regard. 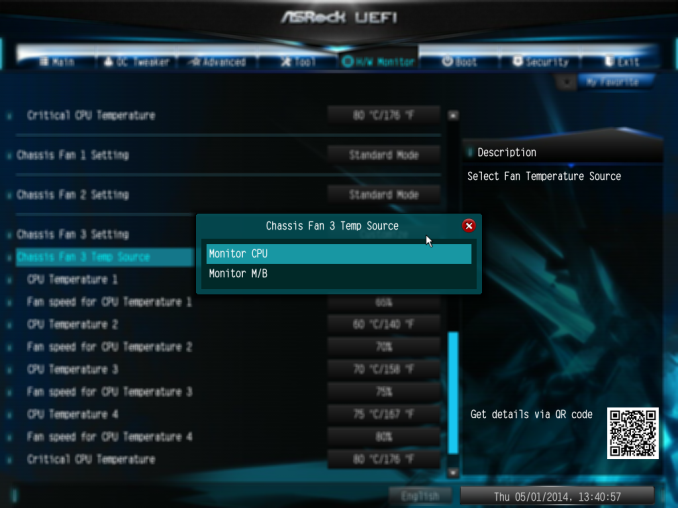 While we get the motherboard name and BIOS version, the CPU name, speed, memory and memory per-slot detection, there is no CPU temperature, CPU voltage or fan speeds. 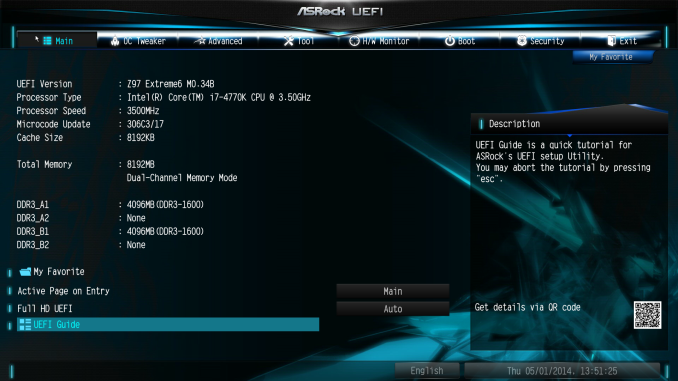 ASRock now has use of the full 1080p resolution in the BIOS, it should be time to put it to use. One of the newer features in the ASRock BIOS will be the My Favorites option, shown on the screenshot above. 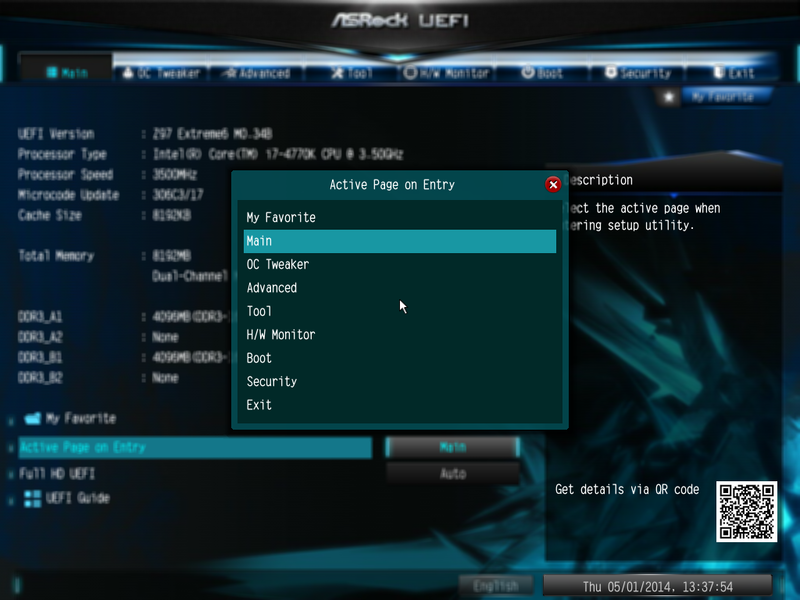 Similar to the implementation of the other manufacturers, users can select options from the BIOS to place into the My Favorites menu for ease of use. Here are a few options I quickly put in to show it working as it should, along with an Active Page on Entry point that allows enthusiasts to bypass any entry screens and go straight to the options that matter. 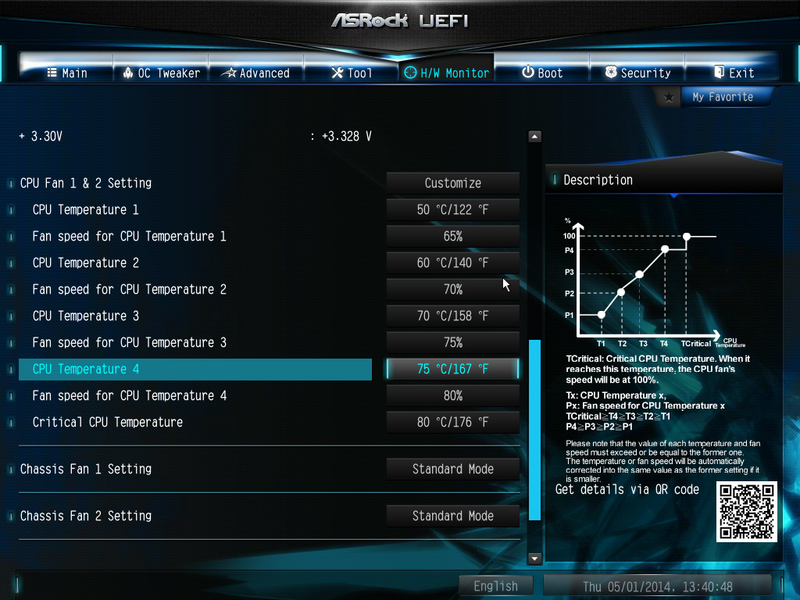 Using this in conjunction with the My Favorites menu should be a no-brainer for extreme overclockers at least. When it comes to the overclocking menu itself, motherboard manufacturers split into two groups. Some will partition off groups of options into separate menus, whereas others will spam a list of everything, hopefully with a sense of order. ASRock offers for the latter, as it took six screenshots to cover the CPU configuration, DRAM Timing, FIVR configuration, and the Voltage configuration. Even for me, that is a little excessive. ASRock might consider putting each of these options into submenus and having copies of the more vital ones (CPU Ratio, BCLK Frequency, XMP, CPU voltage, CPU load line calibration, DRAM voltage) out on the main OC Tweaker page. 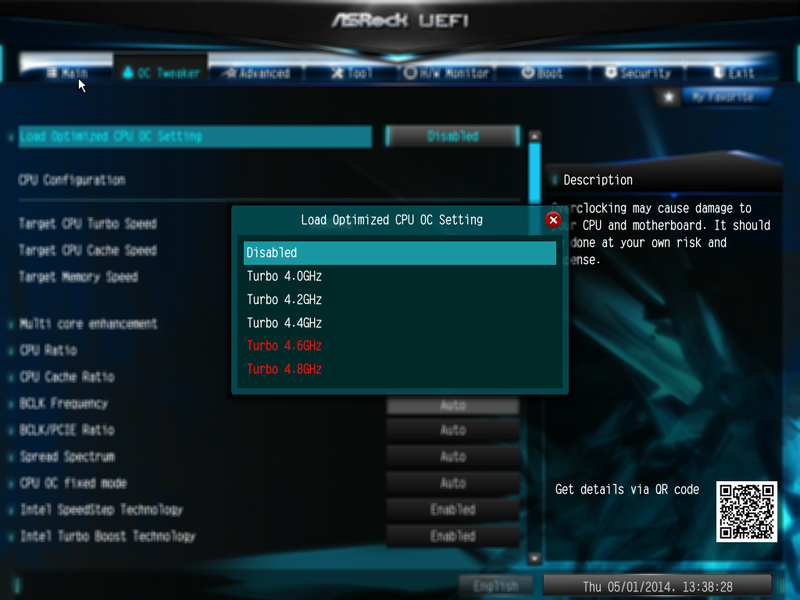 The options use an internal look-up-table that ASRock would have configured, based on their own testing, the best voltage combinations for each setting in order to ensure that most processors are catered for at each step. Our analysis of these is in the overclocking section of this review. Almost all of the options in the BIOS has an associated description listed on the right hand side. 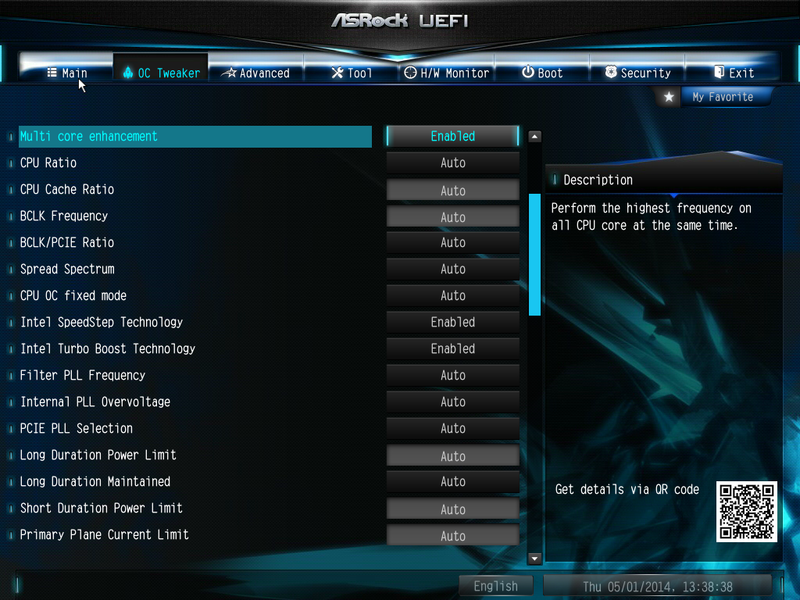 As shown in the screenshot above, Multi-Core Enhancement is enabled by default. The onboard Thunderbolt header, used for Thunderbolt add-in-cards, is disabled by default in the BIOS. This can be enabled by navigating to Advanced -> Intel Thunderbolt. 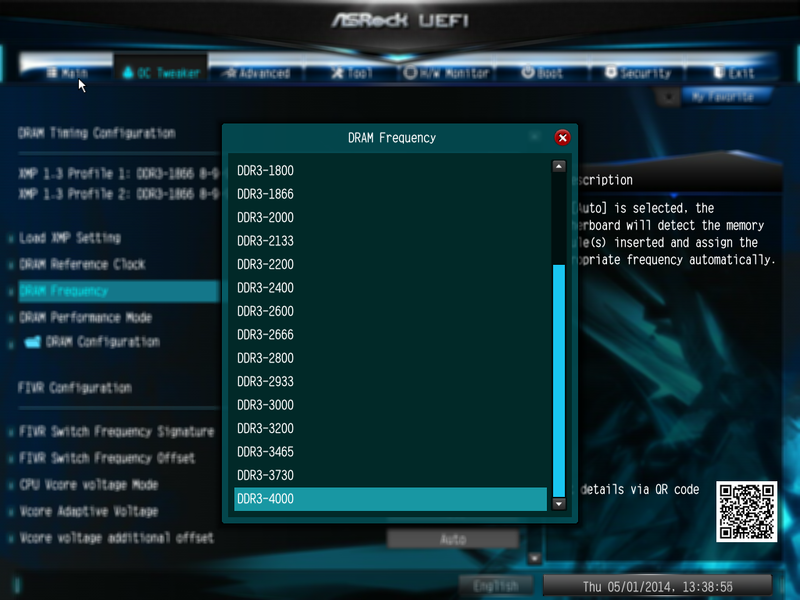 Most of the interesting extra options are found in the Tools menu. 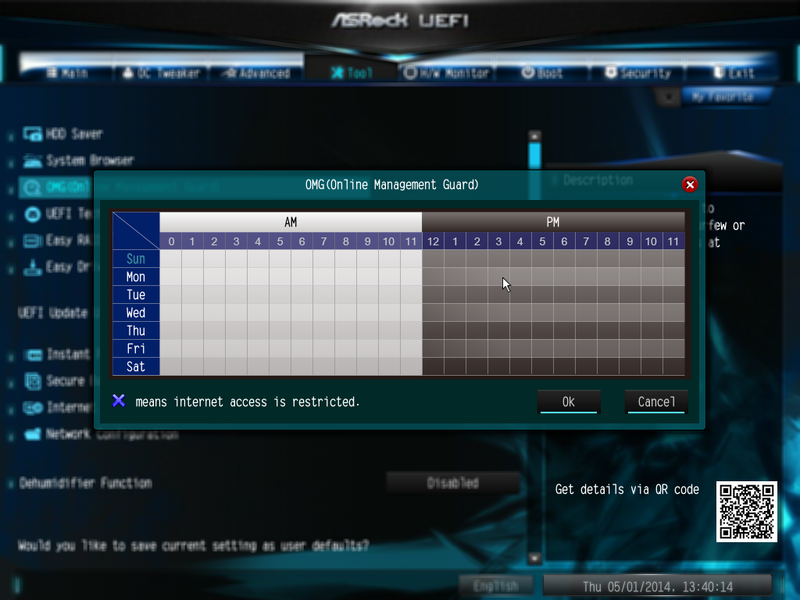 The Online Management Guard (or OMG) is a tool to disable the network ports during certain times of the day, although it does not stop someone changing the rules or the BIOS clock in order to get around it. This is more oriented at parents and non-technical children in my view. 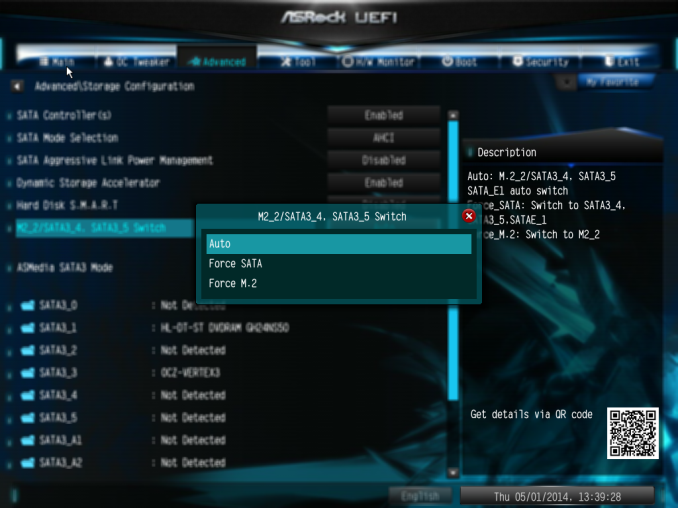 The Tech Support function allows users to submit bug reports when things go wrong, although the system has to be set up via the network configuration option. This means that any system that issues an IP address from a DHCP server should work, rather than via connection sharing. 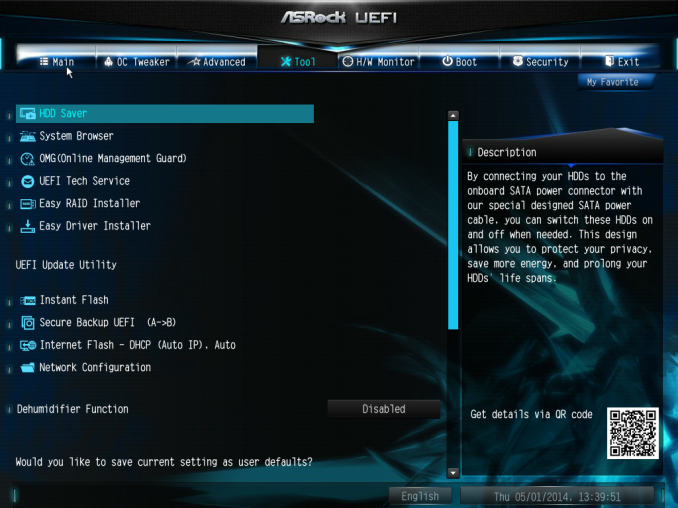 Having the network options enabled also allows users to download updates for the BIOS via the BIOS itself. The dehumidifier function sets up a time interval for the system to enable the fans after shutdown. This is used in environments with high humidity whereby the air in the case can be a lot warmer than the air in the room and as the room cools for an evening water will condense on the inside of the case. With this function, the system will keep the fans running after shutdown so the air inside and outside the case can equilibrate. While I appreciate the multi-point gradient system, there is something fundamentally wrong with the wording here. Without testing the fan to find the RPM to power applied profile, you cannot control the fan via the RPM. 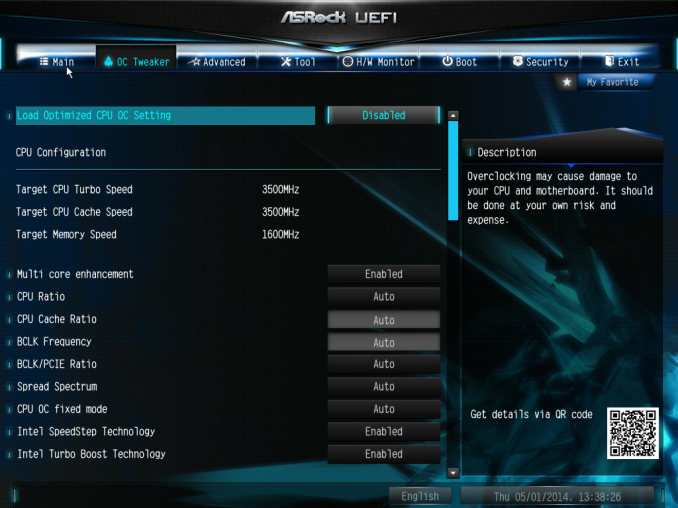 What ASRock means when they say fan speed here is fan power, which is a different word with a different meaning. 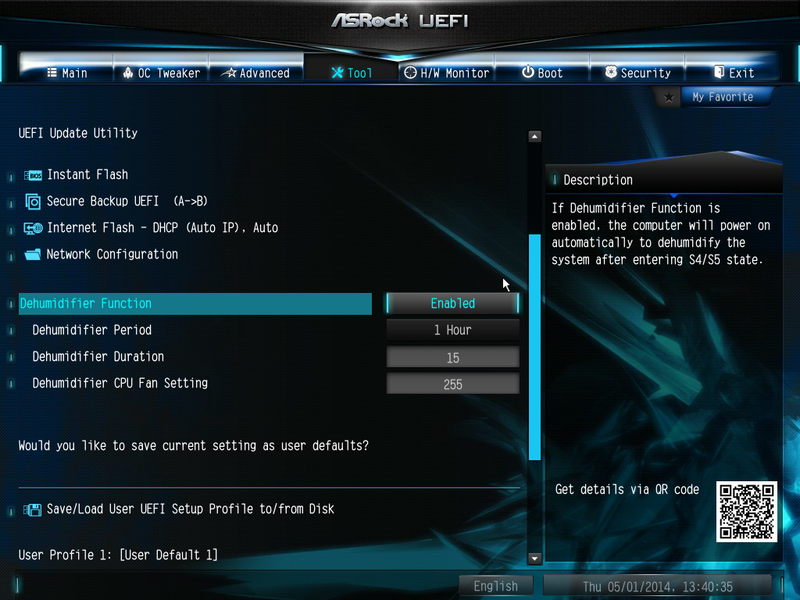 It would seem that the software team, which do test the fans to provide fan profiles, and the BIOS team are not talking to each other on this front. Elsewhere in the BIOS are the boot options, the fast boot options and the security settings. There is no Boot Override function unfortunately. "Results are given in minutes, where the Wii itself scores 17.53; meaning that anything above this is faster than an actual Wii for processing Wii code, albeit emulated." I think the reasoning behind an either/or situation with M.2/SATAe is sound - the consumer most likely will not require 2 high end SSDs, and will go with one that is either M.2 or SATAe, the rest can be served via normal SATA ports. Exactly my thought. So why have SATAe???? 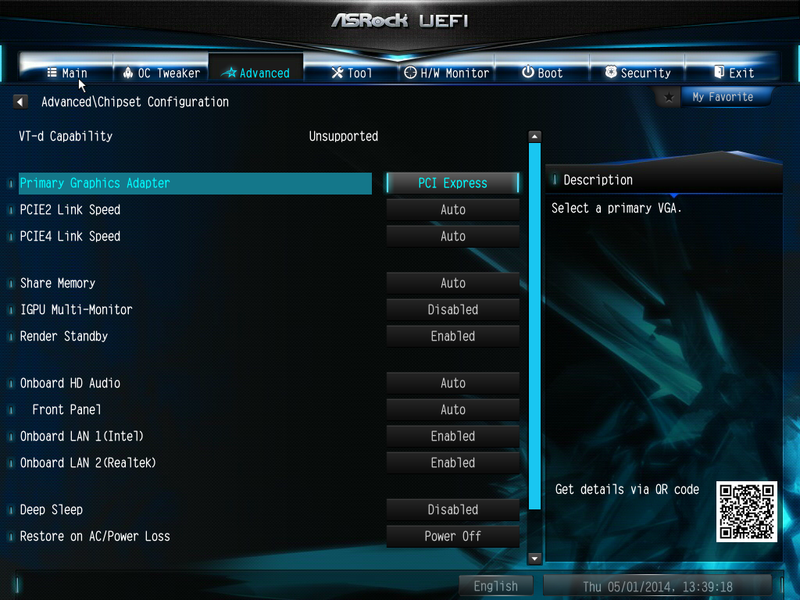 Its great that it uses PCI but it doesn't really offer anything that we couldn't already do. As you've said, "A RAID array of two SATA SSDs offers at least as much theoretical bandwidth as a SATAe while taking up the same amount of ports on your board". Can you explain to me why no mainboard manufacturer is using 4 lanes from the chipsets PCIe 2.0? I mean that would be enough for the Samsung SSD and still has room left. I mean what do I gain from all those SATA and USB ports? Who is actually using all of them?